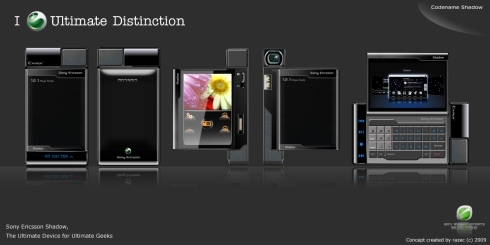 Razec’s series of 3 Sony Ericsson concept phones ends with the superb Sony Ericsson Shadow, the “Ultimate Device for Ultimate Geeks”, as he calls it. Shadow comes with a clamshell design, a textured metal back with a piano black finish, a side flipping mechanism and contour design. The glowing Android logo shows that this smartphone runs the Google OS and it’s a pretty neat and elegant detail. 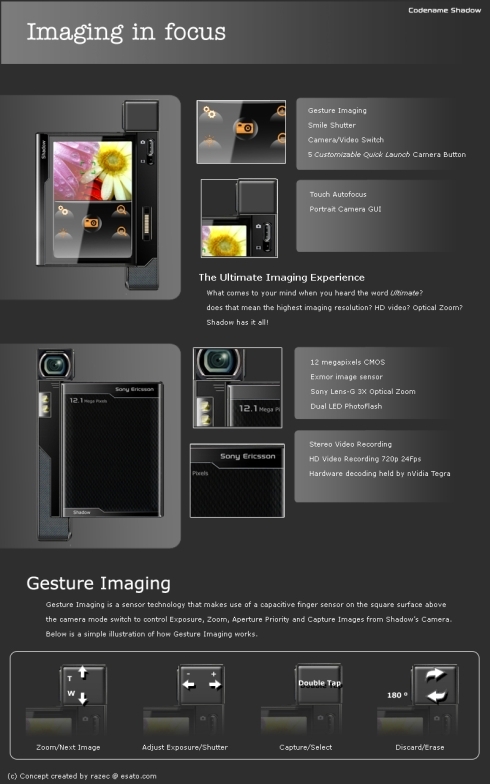 Sony Ericsson Shadow packs a 176 x 36 AMOLED monochrome display (capacitive touch sensitive screen), plus a 480 x 320 pixel TFT capacitive touchscreen with mineral glass protection and chrome bezel. 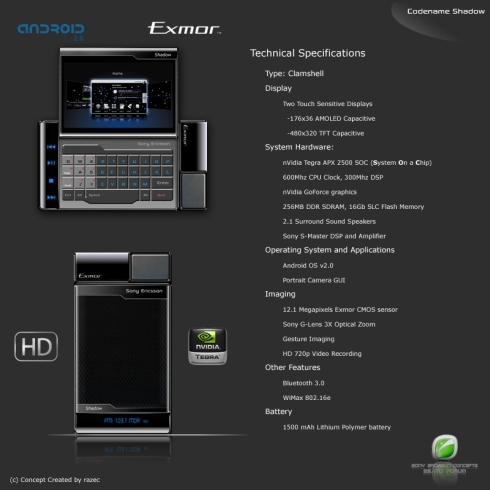 The handset runs Android OS 2.0 and also features a QWERTY keyboard, a 2.1 Stereo speaker subwoofer (wow! 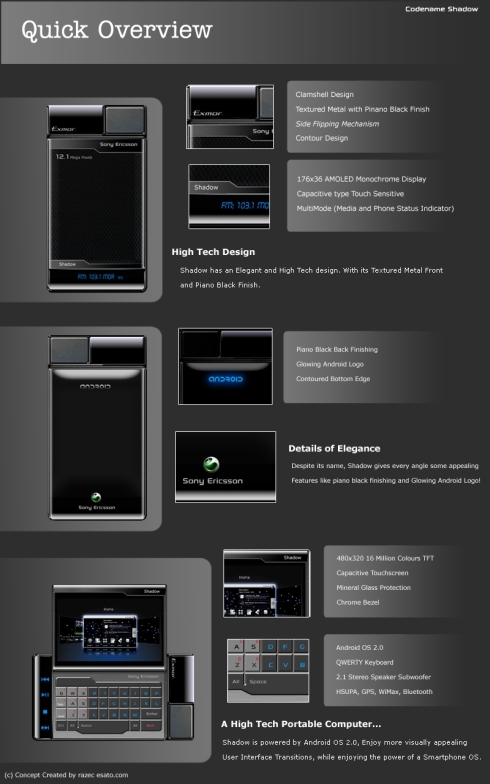 ), plus HSUPA, WiMAX, Bluetooth 3.0 connectivity and GPS. There’s also a great 12.1 megapixel camera on board with a CMOS Exmor image sensor, a Sony Lens-G 3x optical zoom, dual LED PhotoFlash, gesture imaging, smile shutter, camera/video switch, touch autofocus and portrait camera GUI. The smartphone’s camera also supports stereo video recording, HD video recording (720p 24 fps) and hardware decoding thanks to nVidia Tegra. Moving on to more interesting hardware, we learn that Razec’s new concept uses an nVidia Tegra APX 2500 SOC (System On a Chip) chipset, nVidia GoForce graphics, 256MB DDR SDRAM and 16GB SLC Flash memory. Shadow’s specs list includes a 600 MHz CPU clock, 300 MHz DSP, 2.1 surround sound speakers and a Sony S-Master DSP and amplifier. There’s also a 1500 mAh Lithium Polymer battery under the case and this is probably the hottest concept phone I’ve seen in the last months. What do you think? XPERIA X2 Concept by S4k1s Versus the “Real” Thing + Specs Pink iPhone Concept, What’s New?